The name propolis or bee glue is derived from the ancient Greeks, who observed that honeybees will utilize this material to reduce or mostly close off the opening(s) to their hive. Pro (before) polis (the city). Propolis is a sticky, gummy and resinous material collected by honey bees from buds and the bark of trees and shrubs. The bees use this material to fill cracks, reduce openings to their hive and coat the entire inside to help protect it from disease. Bees that harvest propolis are phytochemical and medicinal experts doing specialized work for us, gathering and concentrating on a unique botanical product that would be too expensive and difficult to collect by humans! Documented uses for propolis have included: violin varnish, anesthetic, and ointments for treating burns, cuts, abscesses, and wounds. However, this great antioxidant is believed to be one of the most potent natural antibacterials that reduce inflammation fights fungal, bacterial and viral infections. Most of the compounds responsible for these benefits have been studied in other medicinal plants but unlike propolis, no known plant contains all of them. 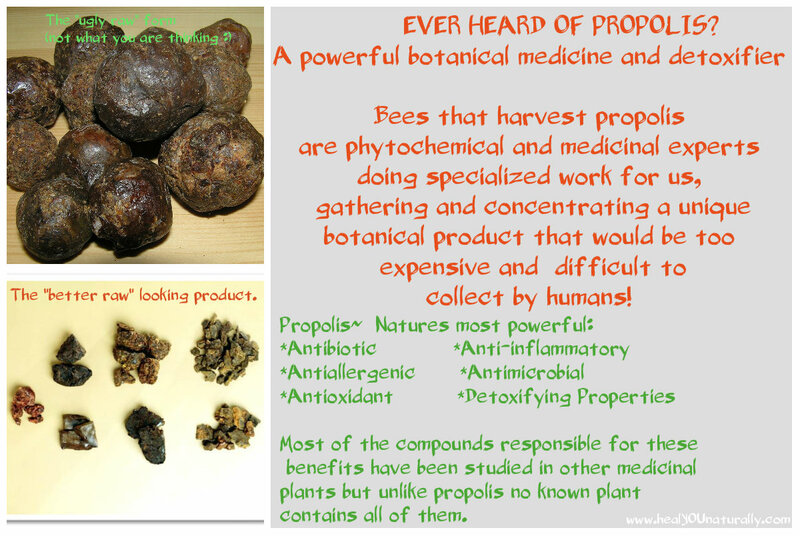 We spent quite some time doing research and found out that Chinese, Australian made Propolis . which has a concentration of a whopping 270 mg of Antioxidants per gram of food or liquid and Brazilian Propolis are among the most potent propolis in the world. Keep an eye on the labels though, because some of the propolis from retail stores comes from China. Today we must proceed with caution with everything that comes from China; we all know why. Oddly enough, China produces one of if not the most potent type of Propolis with 300 mg of Antioxidants per gram of food or liquid. I think you can try and get Chinese bee glue from there if you know of a reliable resource. If you are interested in more superfoods like these you can’t find them at your local shop or visit my”Amazon Influencer Page” , where I have handpicked the best: Supplements, superfoods, safe cocking tools, natural healing/eating books and much more. 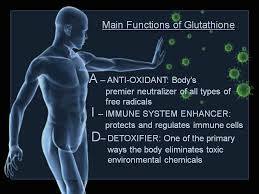 Glutathione-The Master Antioxidant. Are You Deficient? Before I dive into the many benefits of Glutathione, let’s first find out why it has been nicknamed the ‘master antioxidant. Glutathione is a vitally essential cell protectant. It directly prevents reactive hydroxyl free radicals, various other oxygen-centered free radicals, and radical centers on DNA as well as other biomolecules. Glutathione is a major protectant of the skin’s surface, lens, cornea, and retina to prevent radiation damage along with other biochemical fundamentals to detox the kidneys, lungs, liver, intestinal tract, epithelia and other vital organs. This crucial antioxidant is found in certain bacteria and archaea, protecting against damage to important cellular components as a result of reactive oxygen classes such as free radicals. And it is a type of tripeptide found inside all the cells in the body. The reason it has been nicknamed the ‘master antioxidant’ is that of its extraordinary ability to protect our DNA and pretty much every organ in the body. Antioxidants eliminate harmful free radicals efficiently and stop them from causing further damage to the body. As you can see the benefits prove just how much we need it and how our body responds to it. The bad news is that its levels drop dramatically with age and in the process, we lose some of its protective characteristics earlier than we would prefer. At 20 years, a young adult begins to lose glutathione at a rate of about 10-12% per decade. Stress: our health is affected when stress from work, relationships and the pressures of life build up. These stress factors release free radicals which need high levels of glutathione (try liposomal lutathione ) to offset. This situation can be made worse by a diet containing processed foods. These foods don’t provide the glutathione needed and the liver ends up being overworked. With age, the body’s ability to counter this process weakens and its levels eventually drop. Before we learn how to maintain good levels, it is important to note that this master antioxidant helps the body stay well and protect it from diseases like cataracts by maintaining the lens transparency. In other words, it acts as the main antioxidant in the eyes and reverses the effects of UV light. Glutathione also prevents potential brain and nervous system disorders by preventing the many oxidative by-products formed by the brain. The brain disorders prevented can range from stroke, trauma and brain injury, Parkinson’s disease, multiple sclerosis and more. The liver is another organ affected by drops in it. This is because the liver is responsible for filtering out toxins and turning them into soluble compounds that can be eliminated through bile and urine. The two detoxification pathways of the liver, which depend highly on glutathione, suffer most from its depleted supply as they become overwhelmed by toxins which then attack the liver. Since the lungs are directly affected by pollutants and contaminants like cigarettes and environmental toxins, its absence in the respiratory tract can trigger some unwanted lung diseases like asthma, chronic obstructive pulmonary and acute respiratory distress syndrome and pulmonary fibrosis. try liposomal glutathione ). Levels obtainable from foods are limited (considerably less than 150 mg/day), and oxidative elimination can easily exceed this type of metabolic process. You should note that not all supplements out there have been shown to raise glutathione levels mainly because it is a tri-peptide that makes it hard for the body to absorb. Therefore, most cells acquire glutathione by absorbing component parts and extracting it from there. That being said, an amino acid-like L-Methionine has been shown to increase glutathione benefits in the body. This amino acid is converted into cysteine, a necessary ingredient for the production of glutathione. A supplement like Optimal Liposomal (try liposomal glutathione here) from Seeking Health. Not only is it one of the best optimal liposomal Glutathion in the market, but it contains pure natural ingredients that supply only what the body needs. 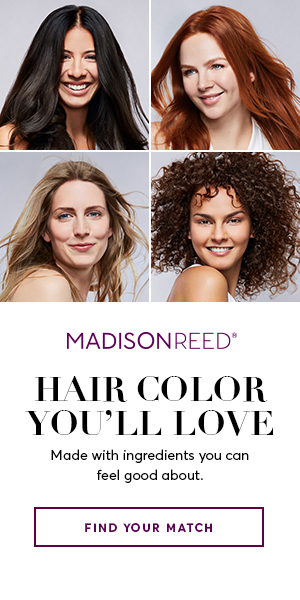 No fillers or dangerous chemicals. It provides natural phosphatidylcholine for the best delivery. Optimal Liposomal goes directly into the bloodstream and is mostly recommended for its quality. It is possible to maintain good levels of glutathione as we get older but it’s up to us to make a positive approach in terms of lifestyle choices and diet. Be thorough when choosing the right supplements to help you maintain your glutathione levels and only go for those with proven benefits to play a part in anti-aging and disease prevention process. Your Turn~ Have you heard of supplemented with Glutathione? Sometimes hearing about someone else’s experience with a particular supplement and their results can help others overcome their condition or feel better. Let’s help others by commenting below. I am sure at this point you have heard of Turmeric and its endless healing benefits. Not only is Turmeric a superfood, it is also one if not– the most potent Anti-inflammatory food that nature has to offer. How do I know that? Well, since I am fascinated with this spice which Indians have been using for centuries– I went on to do a little research to share with you. Let’s learn some more about this amazing super spice and what it can do for you. What is Turmeric and Why Is it Considered a Superfood? Turmeric is a rhizomatously herbaceous perennial plant of the ginger family, Zingiberaceae. It is native to tropical South Asia who has used it for centuries. Turmeric is a very powerful antioxidant that aids in clearing infections. It is one of the best anti-inflammatory foods to prevent and reverse cardiovascular disease, balance cholesterol levels, treat serious states of depression — and even helps reverse the course of Type II Diabetes in pre-diabetic patients as a recent study conducted a the University of Ta. I use turmeric in many of the meals I cook at the very end of the cooking process. That way I don’t destroy the benefits by cooking it too much. I also add it to my smoothies and even soups. We prefer the raw Turmeric version sold at whole foods (root) but when it isn’t available we get the powder organic turmeric from Tropical Traditions a reputable company. I have actually used Turmeric in some of my meals/recipes that I will share in the future. Have you ever used Turmeric? I’d love to hear how you use it and how have you benefited from it. I am sure that as this point you’ve heard Chia Seeds and have asked yourself: What is all the fuzz about these seeds besides growing a figure with grass on top? Chia seeds are an amazing source of protein, Omega -3, are loaded with fiber and work pretty much like a “colon cleanser” only without the side effects of Psyllium husk because when Chia seeds are soaked with any liquid, they absorb that liquid to become gelatinous.Once this gelatinous substance is in your intestines toxins, and extra waste will adhere to this mix and will be removed. This will of course be excreted in your next bowl movement. One of my favorite ways of enjoy Chia seeds is in smoothies, yogurt, salad dressings and of course in this super healthy dessert: Chia seeds pudding, I decided to make my own and it was satisfying, filling, delicate and delicious. Plus the combination of fruits and chia seeds in this recipe make it high in protein, minerals and anti oxidants from both the chia seeds and the berries. Here are some of the top benefits of the ingredients in this amazing pudding. Chia seeds are a great source of Omega 3 fatty acids. For ei: 4 tbs of Chia seeds contain a generous 10 grams of Omega -3 ideal for those of you following the Vegan lifestyle or Salmon isn’t readily available. They also contain 14 grams of Fiber and 8 grams of protein. You can add them to your smoothies, Yogurt, Kefir, oatmeal, meals or like I do to your salads (or salad dressing). You can buy organic chia seeds in bulk at you local Whole Foods, but if you can’t make it to the store, you can buy Chia Seeds here. Scientists have found berries have some of the highest antioxidant levels of any fresh fruits (measured as ORAC), and kale and spinach are the only vegetables with ORAC values as high as fresh, delicious berries. Fresh berries are some of the most powerful (and delicious) disease-fighting foods available. Anthocyanins Color pigments in berries that are powerful antioxidants. Blue, purple, and red color has been associated with a lower risk of certain cancers, urinary tract health, memory function, and healthy aging. Antioxidants Substances that protect the body by neutralizing free radicals or unstable oxygen molecules, which can damage the cells and are a major source of disease and aging. Catechins Catechins are flavonols that support the antioxidant defense system.Catechins found in caneberries are very similar to those found in green tea which studies show may contribute to cancer prevention. The catechins content found in 100 grams (about 3 /4 cup) is as follows: red raspberries, .83 milligrams and Evergreen blackberries, 1.4 milligrams. Dietary Fiber Found only in plant foods, fiber helps maintain a healthy GI tract, lowers blood cholesterol, reduces heart disease and may prevent certain types of cancers. Ellagic Acid A phenolic compound known as a potent anti-carcinogen which has anti-viral and anti-bacterial properties. Scientists feel ellagic acid plays a major roll in cancer prevention and tumor reversal. Fiber A carbohydrate-like substance found only in plants. Dietary fiber helps maintain a healthy gastrointestinal tract and may help prevent certain types of cancers. It can also help to reduce blood cholesterol levels and lower the risk of heart disease. Gallic Acid A potent antioxidant also found in black tea and red wine, shown in tests to inhibit cell proliferation and cell death in prostrate cancer cells. Raw Honey isn’t subjected to the heat of processing, only warmed enough to flow (same temperatures the honey would see inside the hive). We select only premium honey that is pure, smooth and creamy, with the consistency of soft margarine at harvest. It contains live yeast and enzymes, because it has not been processed. It also contains pollen because it has not been filtered—merely screened. Fine textured crystals are characteristic of totally pure, unheated, unprocessed, raw honey. Properly crystallized honey has a fine, smooth texture. Crystallized honey preserves natural goodness and doesn’t drip. The more rapidly honey crystallizes the finer the texture will be. It will also turn harder over time as it crystallizes. Truly raw honeys do not deteriorate with age, but like fine wines, continue to age and develop into more complex tastes. Raw Organic Honey is hard to find locally. We buy the best tasting Raw Organic Honey here. Question: Have you tried Chia Seeds Yet? If so, what is your favorite way to enjoy them?